Gannett is taking its bid for Tribune Publishing straight to Tribune shareholders. A pair of steps announced on Monday are designed to put more pressure on Tribune's board, which is reviewing Gannett's acquisition offer. But even while that review is underway, Tribune is battling Gannett in public, calling the rival newspaper owner "desperate" and disingenuous. "Gannett has no path to control for Tribune Publishing and their tactics clearly demonstrate a desperate and opportunistic attempt to steal the company," Tribune said in a fresh statement on Monday. The tug of war over Tribune started three weeks ago when Gannett made a private offer to buy the other company. The combination would bring together Gannett papers like USA Today and Tribune papers like the Los Angeles Times, the Chicago Tribune and the Baltimore Sun. Gannett executives said they felt rebuffed by their counterparts at Tribune. So last week Gannett went public with its offer of $12.25 per share for Tribune. 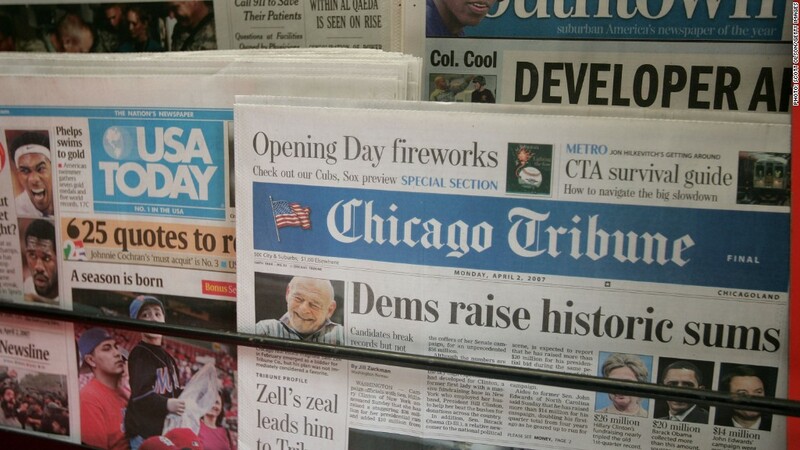 Up until then, Tribune had been trading under $8 per share. In response to the public proposal, Tribune said it had hired "financial and legal advisers to review" the possibility. Perhaps believing that Tribune's board is stalling, Gannett said on Monday morning that it wants Tribune stockholders to speak up by voting to withhold the company's board of directors nominees. Tribune's annual meeting is on June 2. Voting to withhold board members is different from voting against them altogether. And Gannett is not offering its own slate of nominees to the board. But it is essentially calling for a vote of dissatisfaction. Gannett is also seeking to contact shareholders directly by submitting a request for Tribune's shareholder records. Related: Can the L.A. Times survive Gannett? "We intend to give Tribune stockholders the opportunity to send a clear message to the Tribune Board that its lack of engagement with our Board and management team regarding our highly compelling, premium offer for $12.25 per share in cash is unacceptable," Gannett's CEO, Robert Dickey, said in a statement. "We remain ready to work constructively with the Tribune board and management to negotiate a definitive merger agreement and quickly complete a transaction that would provide significant value to both companies' stakeholders," he added. In its response a few hours later, Tribune called Dickey's announcement a "ploy" and a "distraction from the real issue, which is whether the Gannett proposal is in the best interest of the Tribune shareholders." Tribune has brand-new leadership, including new chairman Michael Ferro and CEO Justin Dearborn. One year ago the company's stock was trading around $17, and the executives may be resistant to Gannett's current $12.25 per share offer because they believe they can do better on their own. Even before Gannett's bid, Ferro and Dearborn were planning on presenting its vision for Tribune during a quarterly earnings call on Wednesday. Tribune's rebuttal to Gannett on Monday concluded by saying, "We look forward to sharing our strategy and the various possibilities for our business" at that time. However, many industry analysts still believe Gannett is likely to prevail in its takeover bid eventually.